mundane jane: Nobody is good at everything. I think today is one of my wedding anniversaries, but I can't be sure. Even when we were still married, I had a hard time remembering if we said "I do" on the 20th or the 21st. He was always the one who made sure the calendar was correctly marked. He was also the one who ensured both cars had valid safety inspection stickers and that the ice cube trays were always properly filled. I can't even say with any certainty the exact year we married. After the first 5 or 6 times, I was ashamed to admit it anymore, and it was easier to just follow his lead. Now that I no longer have to buy a gift, there's no real reason to obsess about it. Last year, I started to feel kinda bad about it, so I asked him the exact date. I've forgotten it again, already. To the casual observer, this probably says two things: (1) he was probably a better husband than I was a wife, and (2) I am only marginally capable of managing life outside the halfway house. Both of which are undeniably true. My second wedding anniversary is easier to remember, even though that marriage lasted only half as long as the first. I attribute this to the fact that we were married on Mayday--as in "Mayday. Mayday. Iceberg off the starboard bow," or as I often remember it, "dot-dot-dot-dash-dash-dash-dot-dot-dot." By the time I signed the second set of divorce papers, I told myself that I might as well just go ahead and get married six or seven more times. Then I could say things like "My fourth husband.." or "When I was married to husband number eight..."
But after carefully weighing all the available options, I decided that it was simpler and less expensive to just pretend to be the survivor of half a dozen marriages. If they existed, I'm sure husbands three, four, five, and six would agree. Today's post was written while listening to Bonnie Raitt's 1972 Album, Give It Up. 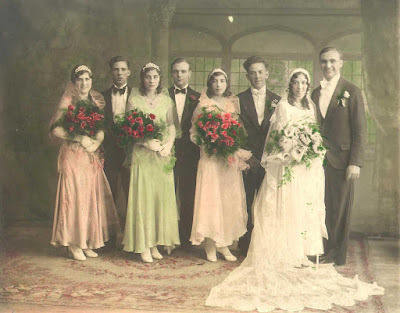 Image, Josephine and Philip Giangreco Wedding 6-21-1930. I truely do not believe the saying that "there is someone out there for everyone". My sister is a case in point..She is much happier being by herself.. although she has 3 grown children by her "only" marriage. She never says "first marriage", but "only marriage. The date was the 20th. I remember because I was there and it was the day before your father's birthday, who usually wasn't.